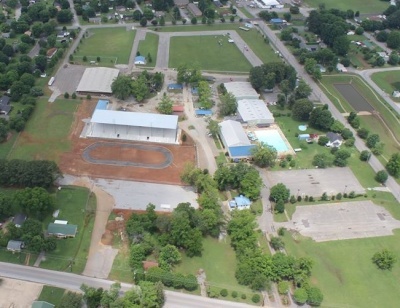 Lawrenceburg Rotary Park is a city owned facility that is home to the Middle Tennessee District Fair and many other community events. It is considered one of the finest multi-use facilities in southern middle Tennessee. 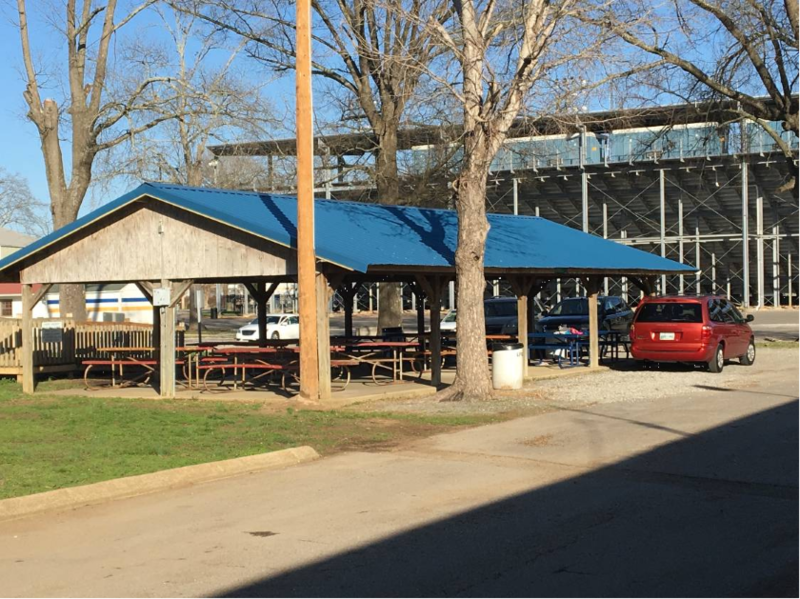 Lawrenceburg Rotary financed the City of Lawrenceburg's purchase of land that is currently Lawrenceburg Rotary Park and assumed responsibility for operation of the Middle Tennessee District Fair in 1950. Fairview Park, as it was then known, consisted of an antiquated swimming pool, a few outdated buildings, and a primitive grandstand area. The club built improved cattle barns, upgraded concession buildings to support the fair, and renamed the facility Lawrenceburg Rotary Park. Over the years, it became apparent that permanent exhibit buildings would be needed if the fair was to achieve its full potential. At the same time, the City of Lawrenceburg needed a Community Center and was preparing to request federal and state grants to build gymnasiums. Rotary agreed to provide matching monies for the grants in exchange for a twenty-five year renewable lease on park facilities. The City of Lawrenceburg would continue routine park maintenance while the Rotary Club maintained responsibility for long range planning and capital improvements. The club has continued its commitment to Lawrenceburg Rotary Park with land acquisitions and capital expenditures totaling approximately three million dollars. Park Improvements consume most of the revenue generated by the Middle Tennessee District Fair. 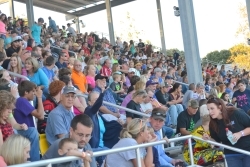 In 2014, the club replaced a 70 year old grandstand seating area with a 1.8 Million Dollar facility with a 4600 seat covered grandstand, pressbox, eight sky boxes, and stand alone restrooms. Public swimming pool with waterslide. The pool was completely renovated in 1990 with new decking, pool liner and filtration equipment. A waterslide was purchased in 1999. The City of Lawrenceburg assumed ownership and day to day management of the pool following the 1990 renovation. Fairside Park, a lighted playground facility that was hand built in 2000 during a five day "makeover" by Lawrenceburg Rotarians and other groups. 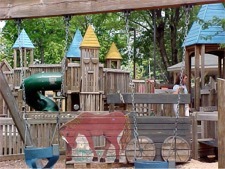 The playground features swings, slides, walk around play areas and a covered gazebo. Twenty-four hour lighting was added in 2001. Three gymnasiums suitable for community sports programs, fair exhibits, trade shows, company parties, and similar activities. Construction began in 1974 and the Bud Webb Memorial Gymnasium was dedicated in 1975. The City of Lawrenceburg added a third gym in the early 1990's. All three buildings are air conditioned. A lighted show ring with grandstand and floor seating for up to 5000 people. This area is suitable for motorsports events, outdoor concerts, horse shows, rodeos, tractor pulls, and other activities. The south grandstand was covered in 1978 and aluminum bleachers were added on the north side in 1981. Improved lighting was added in 2002 and a dedicated pit entrance was constructed in 2006. In 2014, the old facility was replaced with a new 4600 seating capacity covered grandstand and improved rest room facilities. 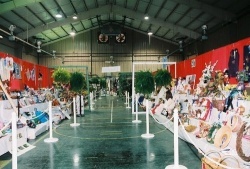 Covered pavilion suitable for livestock exhibitions, trade shows, farm equipment displays, scout jamborees, large picnics, and other activities. The pavillion was constructed in 1995 and expanded in 1997. Rotary demolished old stock barns and constructed a new city maintenance shop to make way for this facility. Weathers Court. A lighted outdoor basketball facility dedicated in 2007 and built with joint funding from Lawrenceburg Rotary and the David Weathers Foundation. 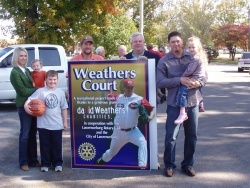 David Weathers is a local resident who played major league baseball for a number of years. Through his foundation, Mr. Weathers has worked with organizations throughout our community to build such facilities. Paved walking track and staging areas. The walking track was installed in the late 1980's, and the staging areas were constructed in 2006. The resulting area is ideal for parade staging, vehicle and horse trailer parking, and of course setting up the fair's carnival midway. An unexpected use has been tailgating activities related to youth football and baseball practice. Permanent lighting and electrical hookups throughout the park. These facilities have greatly improved park security and its function as a multi-use facility. Twenty-four hour lighting is provided in many areas. 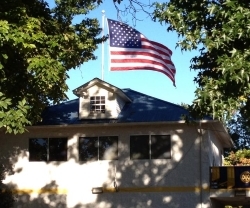 Picnic shelters, green areas, and stand alone public restroom facilities. Rotary is first and foremost a city park, and these facilities support family activities on a year round basis. Permanent meeting facility for the Lawrenceburg Rotary Club and affiliated organizations. This area was renovated and configured into the current meeting room in 1994. It has limited kitchen facilities and seating for over 100 people. In 1997, the meeting room was named Beasley Hall in honor of long time fair manager John N. Beasley (deceased). Middle Tennessee Fair Operations Building. Commonly known as the Front Office, this facility was built in 2002 to beautify the entrance of Lawrenceburg Rotary Park and to improve fair support operations. The building contains a dedicated customer service area, fair secretary's office, secure counting room, permanent ticket booths, and a multi-purpose storage and lounge area. The building was dedicated to the memory of long time Rotarian J. W. Durham following his death in 2011. All or part of Lawrenceburg Rotary Park may be reserved by individuals and recognized organizations for their fund raising and other activities. 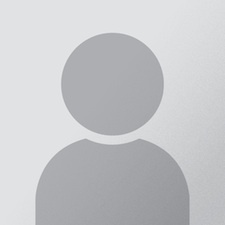 Nominal fees are charged based on the nature of the event and the facilities used. Fees are directed to a park development account that is applied towards maintenance, clean up, and other park expenses. Charges may be waived by the club's Board of Directors on a case by case basis. Click here for information concerning park reservations. The partnership between the City of Lawrenceburg and the Lawrenceburg Rotary Club is a wonderful example of how good things can happen when public and private organizations work together.